"Plotinus taught that there is a supreme, totally transcendent 'One', containing no division, multiplicity or distinction and beyond all categories of being and non-being. His One 'cannot be any existing thing', nor is it merely the sum of all things but 'is prior to all existents'. Plotinus identified his One with the concept of Good and the principle of Beauty." "That which exists is One. Sages call it by various names." This page presents an ambitious interpretation of an ancient perspective on universal religion, grounded and interconnected through the primary concept of Oneness or ONE. ONE -- according to this interpretation -- can be known or experienced in many ways, and is that facet or level of reality religious or spiritual people call "God". This interpretation follows what is commonly called Perennial Philosophy, and builds this thesis though a systematic interpretation of many religious and spiritual traditions that have arisen around the world throughout history. This perennialist interpretation is intended as an integrating and global scientific hypothesis, entirely consistent with science. We have gathered 1,265 quotations on the theme of ONE. Are we proposing a new religion? Pehaps no, perhaps yes. This interpretation -- "all religions are intepretations of a common underlying oneness, perceived in different ways" -- is an intentional creative synthesis, and not a claim that this interpretation in some sense "exists" within the religions themselves, or is observable in an empirical sense, or is inherent in existing traditions. Expressed in these terms, this question is probably unresolvable because this model depends on consistent interpretation and not on empirical observation. This model is an interpretation of the traditions. We are in effect saying "this is the best way to look at it, and it works." There are too many empirical (observable) differences in religions, and religions themselves are not static and monolithic objects with strict and absolutely stable categorical definitions. Instead, we simply suggest this approach as a "synthetic human construction", as a posulate, a hypothesis, adapted as a rationalist understanding of religion and religious experience, and that this kind of model, refined and tuned carefully through relationship-building and co-creativity, can emerge as a comprehensive focus for international and universal connection among religions, spirituality and the disciplines of science. This approach might be capable of supporting an ontology-grounded secular ethics for national or global democracy. 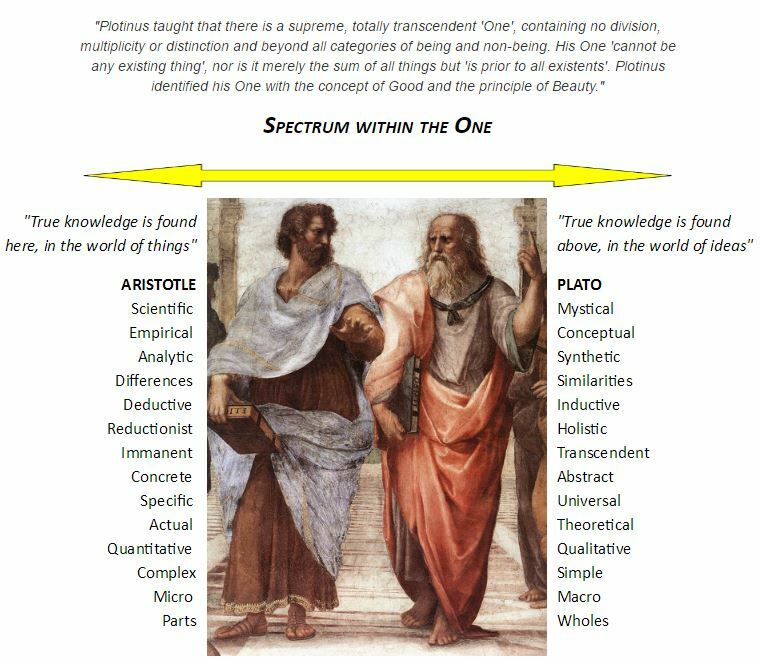 We follow the Wikipedia interpretation of Plotinus on Oneness. We position this idea within the framework of an "ontology" (a "semantic ontology" -- https://en.wikipedia.org/wiki/Upper_ontology). The "top level" and highest universal form is this framework of the One -- known by many names or none, understood as "beyond words" or as Logos, or understood as "non-dual", as unknowable and undifferentiated "beingness" is parsed into concepts in service to human convenience or necessity. Thus, a central thesis emerges -- a point of agreement, a point of negotiation, a "universal standard" intended to faithfully interpret every tradition without distortion -- creating a shared focal point of universal common ground, where it might be strongly claimed that any true seeker and lover of the good and holy and sacred could meet with any other in service to a "world that works for everyone". 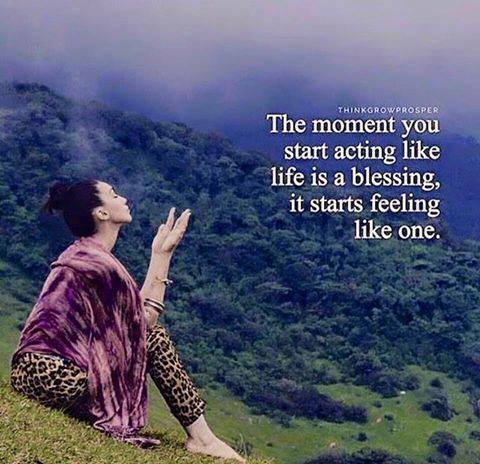 Come from any angle, come from any tradition, come in humble and receptive spirit, be able to listen, and enter a process of universal sacred communion, grounded in a simple universal ethic of relationships held in Oneness. From there, if you wish, you can remain faithful to your own tradition as you understand it, and yet meet with and interact with adherents from anywhere in the world. Adhere to some well-defined and established tradition -- or connect to no existing tradition -- or honor them all through their commonality. This universal point of origin is intended as the common ground of human spirituality and religion. "Perennialism is a perspective within the philosophy of religion which views each of the world's religious traditions as sharing a single, universal truth on which foundation all religious knowledge and doctrine has grown. 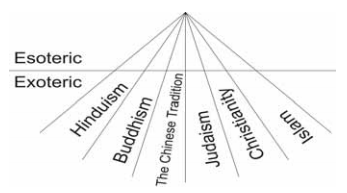 According to this view, each world religion, including but not limited to Christianity, Islam, Judaism, Hinduism, Taoism, Confucianism, Shinto, Sikhism, and Buddhism, is an interpretation of this universal truth adapted to the psychological, intellectual, and social needs of a given culture in a given period of history. The universal truth which lives at the heart of each religion has been rediscovered in each epoch by saints, sages, prophets, and philosophers. These include not only the 'founders' of the world's great religions but also gifted and inspired mystics, theologians and preachers. "Perennialists argue that although the sacred scriptures of the world religions are undeniably diverse and often seem to oppose each other, one can discern a common doctrine. Typically this doctrine is posited as mystical insofar as it views the summum bonum of human life as an experiential union with the supreme being." This statement reviews the major points of this doctrine, which are intended to create an integrated conceptual framework consistent with science and describing the full range of potential spiritual experience and understanding. This "full range" is illustrated by examples taken from various perspectives, schools and cultures. 1) There is a common oneness in reality, containing all things and all concepts. This oneness is the fundamental concept of all religion. 2) This oneness is highly abstract and throughout history has been perceived by human intuition in varying ways. Generally, we are safe in asserting that all major religions and spiritual traditions involve a perspective on this universal common ONE. This concept can be difficult to precisely conceptualize, and this difficulty is responsble for much of the confusion and ambiguity surrounding religion. 3) This ONE is consistent not only with all major religions throughout history, but is also consistent with science. This idea can be understood through deep inuition, in anthropomorphic or metaphorical ways, or in scientific or mathematical terms that are consistent with holism, "semantic ontology" and the logic of set theory. 4) Particular interpretations of this oneness have arisen throughout history, under the guiding influence of inspired prophets and "enlightened" spiritual people, who have influenced their cultures and established the religions of the world. 5) The high diversity of these forms is understandable, and an expression of the wide differences in local cultures, languages, economic and social pressures and needs. These differences in religious forms arise from a natural diversity of human needs in particular contexts. The common ground among them all is the universal containing form of the absolute one, as known by many names. 6) "Distinctions arise" within the common universal framework, driven by common human needs. Those distinctions are the basis of all human concepts and ideas, which are constructed within the framework of oneness. This can be shown in terms which are consistent with deep intuition and mysticism, and also with science, mathematics, psychology, philosophy, semantics and the ontology of language. This thesis is supported here on origin.org through a series of categories which we believe provide a detailed illustration and explanation of this core idea. These categories are taken from and supported by articles in Wikipedia. The five largest religions in the world include billions of people. Wikipedia states that there are as many as 4,200 identifiable and unique religions in the world. There is no one universally-accepted definition of religion. We list religions found on Wikipedia. Any school or sect of spirituality or mysticism that has grown from within religion or influenced religion. Esoteric perspectives often illuminate the mystical and oneness aspects of religion, and provide important insight into common ground. New movements are emerging, combining mystical and traditional perspectives, and often including a scientific perspective. Philosophy has exerted a guiding intellectual influence on many concepts within traditional religion. As religious ideas get sharper, they become more powerful, more effective, and more authentic. A catalog of major alternative points of view - perspectives on or interpretations of the universal form of Oneness as it seen or understood in various ways. Name, concept, interpretation or label of the universal form. Facet of the Godhead as attributed by some tradition or interpretation. A religious or spiritual experience is a subjective experience which is interpreted within a religious or spiritual framework. Methods of adherence or practices for achieving goals. Interpretations of the Godhead in the form of constraints, rules, or guidelines. Scholarly approaches to religion, including scientific or philosophical or psychological ideas, comparative religion, etc. Hinduism is a religion, or a way of life, found most notably in India and Nepal. With approximately one billion followers,Hinduism is the world's third largest religion by population, and the majority religion in India, Nepal and Bali (Indonesia). Hinduism has been called the "oldest religion" in the world, and some practitioners and scholars refer to it as Santana Dharma, "the eternal law" or the "eternal way" beyond human origins. Atenism, or the Amarna heresy, refers to the religious changes associated with the eighteenth dynasty Pharaoh Amenhotep IV, better known under his adopted name, Akhenaten. In the 14th century BC, Atenism was Egypt's state religion for around 20 years, before subsequent rulers returned to the traditional gods and the Pharaohs associated with Atenism were erased from Egyptian records. Cheondoism, spelled Chondoism in North Korean sources (Korean: Cheondogyo; hanja; hangul; literally "Religion of the Heavenly Way"), is a 20th-century Korean religious movement, based on the 19th century Donghak neo-Confucian movement founded by Choe Je-u and codified under Son Byeong-hui. Cheondoism has its origins in the peasant rebellions which arose starting in 1812 during the Joseon dynasty. Jainism, traditionally known as Jain dharma, is an ancient Indian religion that prescribes the path of ahimsa (non-violence) towards all living beings. Jains believe that a human being who has conquered all inner passions comes to possess omniscience; such a person is called a Jina (conqueror). The path practiced and preached by Jinas is Jainism, and the followers of the path are called Jains. Jain philosophy distinguishes the soul (consciousnesses) from the body (matter). Jains believe that all living beings are really soul, intrinsically perfect and immortal. Souls in transmigration (that is, still undergoing repeated births and deaths) are said to be imprisoned in the body. Ahi? Judaism (from Latin: Iudaismus, derived from Greek, originally from Hebrew Yehudah, "Judah"; in Hebrew: Yahadut, the distinctive characteristics of the Judean ethnos) encompasses the religion, philosophy, culture and way of life of the Jewish people. Judaism is an ancient monotheistic religion, with the Torah as its foundational text (part of the larger text known as the Tanakh or Hebrew Bible), and supplemental oral tradition represented by later texts such as the Midrash and the Talmud. Judaism is considered by religious Jews to be the expression of the covenantal relationship that God established with the Children of Israel. Perennialism is a perspective within the philosophy of religion which views each of the world’s religious traditions as sharing a single, universal truth on which foundation all religious knowledge and doctrine has grown. According to this view, each world religion, including but not limited to Christianity, Islam, Judaism, Hinduism, Taoism, Confucianism, Shinto, Sikhism, and Buddhism, is an interpretation of this universal truth adapted to cater for the psychological, intellectual, and social needs of a given culture of a given period of history. The universal truth which lives at heart of each religion has been rediscovered in each epoch by saints, sages, prophets, and philosophers. Taoism (also called Daoism) is a religious or philosophical tradition of Chinese origin that emphasizes living in harmony with the Tao (also romanized as Dao). The term Tao means "way", "path", or "principle", and can also be found in Chinese philosophies and religions other than Taoism. In Taoism, however, Tao denotes something that is both the source of, and the force behind, everything that exists. Although the Tao itself is not seen as an independent divinity, being more comparable to the Buddhist concepts of dharma and karma, taoism is nonetheless a Polytheistic religion that contains a multitude of gods. Tenrikyo, sometimes rendered as Tenriism, is a monotheistic, Shinto-derived new religion originating from the teachings of a 19th-century Japanese woman named Nakayama Miki, known to her followers as Oyasama. Followers of Tenrikyo believe that God, known by several names including Tenri-?-no-Mikoto, expressed the divine will through Nakayama's role as the Shrine of God, and to a lesser extent the roles of the Honseki Izo Iburi and other leaders. Tenrikyo's worldly aim is to teach and promote the Joyous Life, which is cultivated through acts of charity and mindfulness called hinokishin. Theosophy (from Greek theosophia, which comes from the combination of words theos, God sophia, wisdom; literally "God's wisdom") refers to schools of esoteric philosophy concerning, or seeking direct knowledge of, presumed mysteries of being and nature, particularly concerning the nature of divinity. In Kant's philosophy, a category is a pure concept of the understanding. A Kantian category is a characteristic of the appearance of any object in general, before it has been experienced. Kant wrote that "They are concepts of an object in general…." Kant also wrote that, "…pure concepts [Categories] of the understanding…apply to objects of intuition in general…." Such a category is not a classificatory division, as the word is commonly used. It is, instead, the condition of the possibility of objects in general, that is, objects as such, any and all objects, not specific objects in particular. In ontology, the different kinds or ways of being are called categories of being or simply categories. To investigate the categories of being is to determine the most fundamental and the broadest classes of entities. A distinction between such categories, in making the categories or applying them, is called an ontological distinction. Pre-Socratic philosophy is Greek ancient philosophy before Socrates (and includes schools contemporary to Socrates that were not influenced by him. In Classical antiquity, the Presocratic philosophers were called physiologoi (in English, physical or natural philosophers). Aristotle called them physikoi ("physicists", after physis, "nature") because they sought natural explanations for phenomena, as opposed to the earlier theologoi (theologians), whose philosophical basis was supernatural.Diogenes Laërtius divides the physiologoi into two groups, Ionian and Italiote, led by Anaximander and Pythagoras, respectively. Schopenhauer's criticism of Kant's schemata is part of Schopenhauer's criticism of the Kantian philosophy which was published in 1819. In the appendix to the first volume of his main work, Arthur Schopenhauer attempted to assign the psychological cause of Kant's doctrines of the categories and their schemata. According to the philosopher William L. Rowe: "In the popular sense of the term, an agnostic is someone who neither believes nor disbelieves in God, whereas an atheist disbelieves in God." Agnosticism is a doctrine or set of tenets rather than a religion as such. Theism, in the field of comparative religion, is the belief in the existence of deities. In popular parlance, the term theism often describes the classical conception of god(s) that is found in the monotheistic and polytheistic religions. The term theism derives from the Greek theos meaning "god". The term theism was first used by Ralph Cudworth (1617–1688). In Cudworth's definition, they are "strictly and properly called Theists, who affirm, that a perfectly conscious understanding being, or mind, existing of itself from eternity, was the cause of all other things". Aten (also Aton, Egyptian jtn) is the disk of the sun in ancient Egyptian mythology, and originally an aspect of the god Ra. The deified Aten is the focus of the monolatristic, henotheistic, monistic or monotheistic religion of Atenism established by Amenhotep IV, who later took the name Akhenaten (died ca. 1335 BCE) in worship and recognition of Aten. In his poem "Great Hymn to the Aten", Akhenaten praises Aten as the creator, giver of life, and nurturing spirit of the world. Aten does not have a Creation Myth or family, but is mentioned in the Book of the Dead. The worship of Aten was eradicated by Horemheb. In Hinduism, Brahman connotes the highest Universal Principle, the Ultimate Reality in the universe. In major schools of Hindu philosophy it is the material, efficient, formal and final cause of all that exists. It is the pervasive, genderless, infinite, eternal truth and bliss which does not change, yet is the cause of all changes. Brahman as a metaphysical concept is the single binding unity behind the diversity in all that exists in the universe. In religious belief, a deity is either a natural or supernatural being, who is thought of as holy, divine, or sacred. Some religions have one supreme deity, while others have multiple deities. A male deity is a god (though "God" is used in a gender-neutral way in monotheistic religions), while a female deity is a goddess. In the Platonic, Neopythagorean, Middle Platonic, and Neoplatonic schools of philosophy, the demiurge is an artisan-like figure responsible for the fashioning and maintenance of the physical universe. The term was subsequently adopted by the Gnostics. Although a fashioner, the demiurge is not necessarily the same as the creator figure in the familiar monotheistic sense, because both the demiurge itself plus the material from which the demiurge fashions the universe are considered either uncreated and eternal, or the product of some other being, depending on the system. El Shaddai (Hebrew: , IPA: [ela?d?aj]) or just Shaddai is one of the names of the God of Israel. El Shaddai is conventionally translated as God Almighty but while the translation of El as "god" or "lord" in the Ugarit/Canaanite language is straightforward, the literal meaning of Shaddai is the subject of debate. Elohim (Hebrew) is a grammatically plural noun for "gods" or "Deity" in Biblical Hebrew. In the modern it is often times referred to in the singular despite the -im ending that denotes plural masculine nouns in Hebrew. God the Father is a title given to God in various religions. In Judaism, God is described as "Father" as he is seen as the absolute one, indivisible and incomparable, transcendent, immanent, and non-corporeal God of creation and history. The God in Judaism is the giver of the shabbath and the torahs—written, oral, mystical—to his chosen people. In Judaism, the use of the "Father" title is generally a metaphor, referring to the role as Life-giver and Law-giver, and is one of many titles by which Jews speak of and to God. God the Son is the second person of the Trinity in Christian theology. The doctrine of the Trinity identifies Jesus as the metaphysical embodiment of God the Son, united in essence but distinct in person with regard to God the Father and God the Holy Spirit (the first and third persons of the Trinity). In these teachings, God the Son pre-existed before incarnation, is co-eternal with God the Father (and the Holy Spirit), both before Creation and after the End (see Eschatology). Son of God for some draws attention to his humanity, whereas God the Son refers more generally to his divinity, including his pre-incarnate existence. Ishvara (Sanskrit: , vara) is a concept in Hinduism, with a wide range of meanings that depend on the era and the school of Hinduism. In ancient texts of Indian philosophy, Ishvara means supreme soul, Brahman (Highest Reality), ruler, king or husband depending on the context. In medieval era texts, Ishvara means God, Supreme Being, personal god, or special Self depending on the school of Hinduism. Jehovah is a Latinization of the Hebrew, one vocalization of the Tetragrammaton (YHWH), the proper name of the God of Israel in the Hebrew Bible. Rabbinic Judaism describes seven names which are so holy that, once written, should not be erased: YHWH, El ("God"), Elohim ("Gods"), Eloah ("God"), El Shaddai, and Tzevaot or Sabaoth ("Of Hosts"). Other names are considered mere epithets or titles reflecting different aspects of God, but chumrah sometimes dictates especial care such as the writing of "G-d" instead of "God" in English or saying t-Vav (, lit. "9-6"
In religious philosophy, the Absolute is the concept of (a form of) Being which transcends limited, conditional, everyday existence. The manifestation of the Absolute has been described as the Logos, Word, theta or Ratio (Latin for "reason"). The All (also called The One, The Absolute, The Great One, The Creator, The Supreme Mind, The Supreme Good, The Father, and The Universal Mother) is the Hermetic, pantheistic, pandeistic or panentheistic view of God, which is that everything that is, or at least that can be experienced, collectively makes up The All. One Hermetic maxim states, "While All is in The All, it is equally true that The All is in All." In religious philosophy, the Absolute is the concept of (a form of) Being which transcends limited, conditional, everyday existence. The manifestation of the Absolute has been described as the Logos, Word, theta or Ratio (Latin for "reason"). Related concepts are the Source, Fountain or Well, the Centre, the Monad or One, the All or Whole, the Origin (Arche) or Principle or Primordial Cause, the Sacred or Holy or Utterly Other (Otto), the Form of the Good (Plato), the Mystery, Nirvana, the Ultimate, the Ground or Urground ("Original Ground"). Omnipresence or ubiquity is the property of being present everywhere. This property is most commonly used in a religious context as an attribute of a deity or supreme being. The omnipresence of a supreme being is conceived differently by different religious systems. In monotheistic beliefs like Christianity, Judaism, and Islam the divine and the universe are separate, but the divine is present everywhere. In pantheistic beliefs the divine and the universe are identical. In panentheistic beliefs the divine interpenetrates the universe, but extends beyond it in time and space. Omniscience, mainly in religion, is the capacity to know everything that there is to know. In particular, Dharmic religions (Hinduism, Jainism, Buddhism and Sikhism) and the Abrahamic religions (Judaism, Christianity, and Islam) believe that there is a divine being who is omniscient. An omniscient point-of-view, in writing, is to know everything that can be known about a character, including past history, thoughts, feelings, etc. In Latin, omnis means "all" and sciens means "knowing". Bindu is a Sanskrit word meaning "point" or "dot". A bindi is a small, ornamental, devotional dot applied to the forehead in Hinduism. The Christian Cross (†), seen as a representation of the instrument of the crucifixion of Jesus, is the best-known symbol of Christianity. The other symbol for Christianity is an ichthys. It is related to the crucifix (a cross that includes a usually three-dimensional representation of Jesus' body) and to the more general family of cross symbols. The basic forms of the cross are the Latin cross (?) and the Greek cross (? ), with numerous variants used in heraldry and in various confessional contexts. Mysticism is "a constellation of distinctive practices, discourses, texts, institutions, traditions, and experiences aimed at human transformation, variously defined in different traditions." 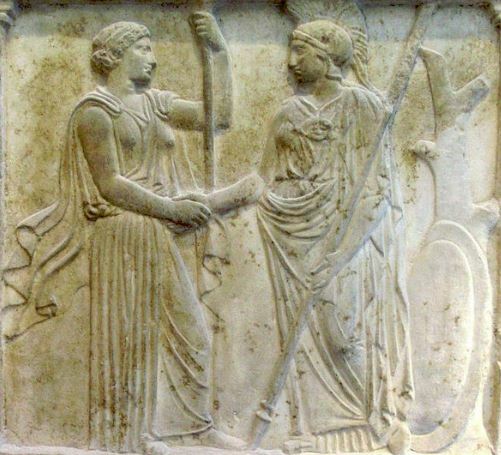 The term "mysticism" has Ancient Greek origins with various historically determined meanings. Derived from the Greek word , meaning "to conceal", mysticism referred to the biblical liturgical, spiritual, and contemplative dimensions of early and medieval Christianity. During the early modern period, the definition of mysticism grew to include a broad range of beliefs and ideologies related to "extraordinary experiences and states of mind". Satori is a Japanese Buddhist term for awakening, "comprehension; understanding". It is derived from the Japanese verb satoru. In the Zen Buddhist tradition, satori refers to the experience of kensho, "seeing into one's true nature". 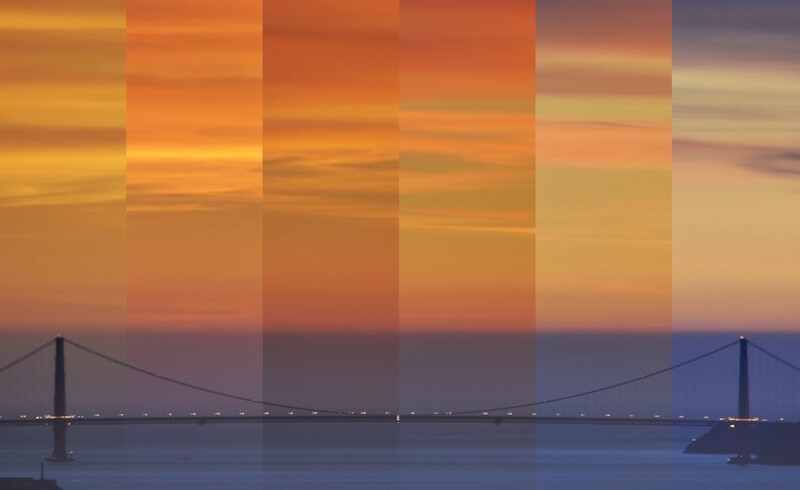 Ken means "seeing," "sho" means "nature" or "essence." Satori and kensho are commonly translated as enlightenment, a word that is also used to translate bodhi, prajna and buddhahood. Kavanah or kavana (also pronounced kavona by some Ashkenazi Jews) , plural kavanot or kavanos, (Intention or "direction of the heart ") is the mindset often described as necessary for Jewish rituals (mitzvot). Once the subject of great debate among medieval commentators, traditional Jewish sources now accept that fulfilling mitzvot without at least minimal kavanah is insufficient. Ethical codes are adopted by organizations to assist members in understanding the difference between 'right' and 'wrong' and in applying that understanding to their decisions. An ethical code generally implies documents at three levels: codes of business ethics, codes of conduct for employees, and codes of professional practice. Niyama (Sanskrit: ) literally means positive duties or observances. In Indian traditions, particularly Yoga, niyamas are recommended activities and habits for healthy living, spiritual enlightenment and liberated state of existence. It has multiple meanings depending on context in Hinduism. In Buddhism, the term extends to the determinations of nature, as in the Buddhist niyama dhammas. In P?li the spelling niy?ma is often used. The two most prominent systems, canon law and sharia, differ from other religious laws in that canon law is the codification of Catholic, Anglican and Orthodox law as in civil law, while sharia derives many of its laws from juristic precedent and reasoning by analogy (as in a common law tradition). The Five Precepts constitute the basic code of ethics undertaken by "lay followers" of Buddhism. The precepts in all the traditions are essentially identical and are commitments to abstain from harming living beings, stealing, sexual misconduct, lying and intoxication. The Ten Precepts of Taoism were outlined in a short text that appears in Dunhuang manuscripts. The precepts are the classical rules of medieval Taoism as applied to practitioners attaining the rank of Disciple of Pure Faith. They first appeared in the Scripture on Setting the Will on Wisdom . The Christian cross has traditionally been a symbol representing Christianity or Christendom as a whole. 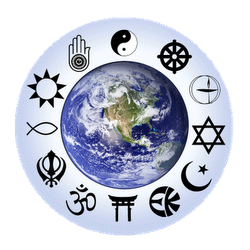 In the course of cultural relativism as it developed in the western world in the late 20th century, there have been efforts to design comparable "symbols" representing all of the world's religions.